Through the Operation Round Up® (ORU) program, Stearns Electric Association gives our member-owners the opportunity to give back to the community. The rounded-up funds (between 1¢ and 99¢) are placed in a trust fund that is administered by a trust board appointed by the Cooperative’s elected Board of Directors. Operation Round Up® funds are given to local civic organizations and worthy causes through an application and selection process. In March, the St. Cloud Amateur Radio Club was chosen as one of those recipients. HAM radio is popular hobby where licensed individuals come together to operate radio electronics in order to communicate across town, around the world or even into space. HAM radio has been around for over a century. The St. Cloud Amateur Radio Club began as the Mic and Key Club in 1917 and is one of the top ten oldest clubs in the nation. In 1922, the club affiliated itself with the American Radio Relay League and became the St. Cloud Amateur Radio Club (SCARC). Today, the club has nearly 100 members. Headquartered in their own clubhouse on Fourth Street North in Waite Park, club members range from teens to 80-year old’s, and include farmers, radio engineers and financial professionals, to name a few. “We have two main focuses in the SCARC: public safety and community,” Charlie Chirhart, volunteer and member, said. 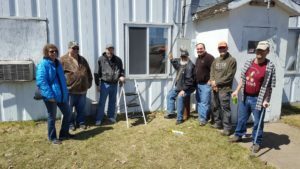 The SCARC houses the National Weather Service (NWS) SKYWARN Program for Benton and Stearns counties in Central Minnesota. SKYWARN is a program where trained volunteer weather spotters provide first-hand reports of severe and hazardous weather conditions. Spotters help meteorologists issue severe weather warnings, which are oftentimes life-saving. Despite the advanced Doppler Radar technology available to the NWS, weather spotters are necessary to help determine accurate and credible weather conditions in order to issue timely severe weather warnings. How did the partnership begin between the NWS and St. Cloud Amateur Radio Club? Many SKYWARN volunteers are amateur radio operators already, which allows for easy, and more importantly, quick communication between a spotter on the ground and the National Weather Service in Chanhassen, Minn. When there is a potential for severe weather, area spotters are paged. Spotters call in to net control, which is essentially three to four people back at the SCARC clubhouse who direct the spotters where to report during the storm. Spotters then send detailed weather information back to net control and net control turns around and reports that information directly to the NWS in Chanhassen, Minn. Chances are, if a severe weather or tornado warning is issued in our area, spotters from the SCARC were directly involved. “When you hear a tornado siren in your community, it most likely means that one of our spotters identified spinning within a storm or even saw a tornado,” Chirhart said. In addition to storm spotting, amateur radio clubs are available to help communicate in any disaster, no matter how large or small. Every year, clubs around the country participate in a 24-hour emergency drill, which helps members stay up-to-date on training and allows clubs to be ready to react in any disaster. These drills allow the SCARC to practice setting up their broadcasting equipment in a timely manner, even in remote areas. “When 9-11 happened, HAM operators stepped in to help with communication, not only for the general public, but also for fire and police departments,” he said. “We are not the main communicators in a disaster, but we are the backup,” he continued. This means that in emergency situations where communication infrastructure is overloaded, (i.e. downed cellular phone networks,) the Federal Communications Commission (FCC) can permit HAM radio operators to communicate with organizations like FEMA, the NWS, the military, public service organizations and more to help organize and assist in disaster relief efforts. In addition to public safety, the SCARC prides its club for its community involvement. The Club partners with many local and statewide events including the Tour of Saints, Tour de Tonka, Annandale Triathlon, as well as the MS 150 and MS 500 bike rides. When a biker needs a repair or first aid of any sort, those bikers call the control center, which then radios the patrol trucks to go assist as needed. Community involvement is also one of Stearns Electric Association’s organization values. The Operation Round Up® program helps the Cooperative give back to hundreds of area non-profit and community organizations every year. Although organizations can use Operation Round Up® funds for a wide-range of projects, the SCARC plans to focus the funds received on energy improvements for their clubhouse. Since the program’s inception in 1993, Operation Round Up (ORU) and Stearns Electric members have awarded over $2.1 million to local non-profit organizations and community service programs. In March 2018, Stearns Electric and ORU contributed $48,900.